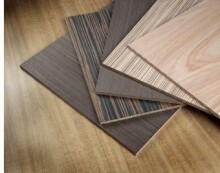 Elite Trimworks offers an extensive line up of Veneered MDF Beaded Sheets. 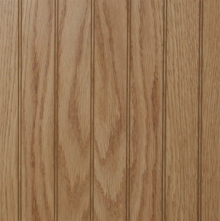 In Red Oak, or any other wood of choice to help you achieve your project vision. 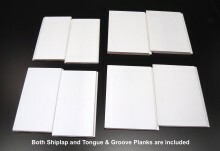 When making your panel or sheet size choices, you can choose your thickness, length, face veneer, size and core; when working with veneers you want to keep in mind that we recommend 3/8" thick or more and the V Groove for all veneered beadboard. Our suggestion is based on extensive research and is an industry standard. Although we can cut many different types and depths of grooves, the "V" bead works best in creating the beaded illusion on veneered beadboard. 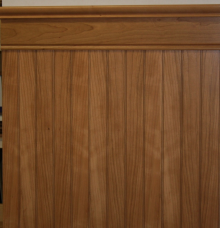 For rigidity, we recommend your beadboard substrate be a minimum of 3/8" thick. Veneer is a natural material. No two pieces of veneer will match exactly in colour, character and appearance, the desired look when installing natural wood. Veneer, MDF and particleboard are not waterproof products. Red Oak Sheet 4' x 8' x 1/2"